Many emerging sensor network applications require sensor node deployment in challenging environments that are remote and inaccessible. In such applications, it is not always possible to deploy base stations in or near the sensor field to collect sensory data. Therefore, the overflow data generated by some nodes is first offloaded to other nodes inside the network to be preserved, then gets collected when uploading opportunities become available. In this paper, we study a generalized data preservation problem in sensor networks, whose goal is to minimize the total energy consumption of preserving data inside sensor networks, given that each node has limited battery power. With an intricate transformation of the sensor network graph, we demonstrate that this problem can be modeled and solved as a minimum cost flow problem. 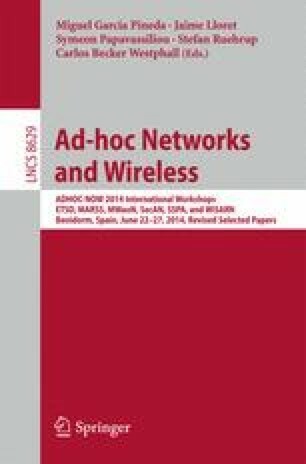 Also, using data preservation in sensor networks as an example, we show that seemingly equivalent maximum flow techniques can result in dramatically different network performance. Much caution thus needs to be exercised while adopting classic network flow techniques into sensor network applications, despite successful application of network flow theory to many existing sensor network problems. Finally, we present a load-balancing data preservation algorithm, which not only minimizes the total energy consumption, but also maximizes the minimum remaining energy of nodes that receive distributed data, thereby preserving data for longer time. Simulation results show that compared to the existing techniques, this results in much evenly distributed remaining energy among sensor nodes. This work was supported in part by the NSF Grant CNS-1116849.